Although considered to be a vegetable, zucchini - otherwise known as a courgette - are actually the immature fruit of a marrow squash – more specifically, the swollen ovary of the female flower. Zucchini can be yellow, green or light green, and generally have shape similar to a ridged cucumber, although there are a few cultivars available that can produce a rounded or bottle-shaped fruit. Like all summer squash, zucchini can trace their ancestry back to the American continent, however the varieties of squash typically known as ‘zucchini’ were actually developed in Italy - many generations after their introduction from their country of origin. The first records of courgettes in the United States date back to the early 1920s - almost certainly brought over by Italian immigrants. In order to achieve an early crop - and yet have protection against late, spring frosts - zucchini can easily be started off indoors. Zucchini seed can be sown anytime from mid March through to late May. Using a good quality soil-based compost such as John Innes ‘Seed and Potting’, fill 3 inch pots to within ½ inch of the top of the pot. Sow two seeds per pot – on their sides - placing each seed ½ an inch deep. Temperature is important when it comes to germinating zucchini seed and so once they have been watered in they will need to be placed in a warm, bright position at a temperature of between 65 to 70 degrees Fahrenheit. Alternatively they can be placed in a heated propagator. 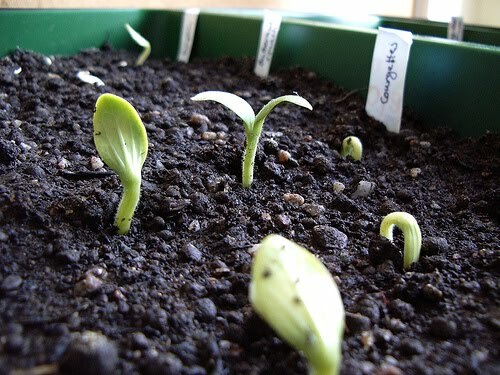 Once the seedlings emerge, the weaker one can be removed from each pot. Harden off the young plants by putting the first sowing into cold frames at the end of May. Plant them out after about two or three weeks once the risk of late frosts have passed. Remember to water the pots well before planting out, and avoid holding the plants by their stems as they are easily bruised causing irreparable damage. If the weather is cool, cover each plant with a cloche for the first week or so, to give them a little extra warmth and protection. Alternatively, use half of a clear plastic 5 litre mineral bottle. Cut the bottle into two halves in order to make two excellent cloches. The top half - whilst giving good protection against the weather – will also allow air and moisture to circulate through the neck of the bottle. TOP TIP. To prevent flying insects entering through the neck of the bottle, cover with a small piece of fleece and secure it in place with an elastic band.